于俊秋, 吴珍汉, 赵珍, 季长军, 于俊博, 康健. 藏北改则康托盆地逆冲推覆构造磷灰石裂变径迹年代学制约[J]. 地质通报, 2018, 37(6): 987-995. Yu J Q, Wu Z H, Zhao Z, Ji C J, Yu J B, Kang J. Apatite fission track constraint on thrust faults in Kangtuo Basin, north-ern Tibet[J]. Geological Bulletin of China, 2018, 37(6): 987-995. Abstract: Four rock samples collected from the Kangtuo Basin in northern Tibetan Plateau were used to determine the apatite fission track ages. Results of all the samples show that the individual grains belong to a single population with a single mean age and have central ages of 77±6Ma, 62±5Ma, 44±3Ma and 35±2Ma. Their mean track lengths are 11.6±2.0～13.3±1.9μm with a single peak. The authors used thermal history simulation software AFTSolve to simulate the thermal history of the samples and the results show three important stages of tectonic movement in Kangtuo Basin since Late Mesozoic. From 100Ma to 65Ma, the cooling and denuda-tion rates were 1.46～4.26℃/Ma and 0.05～0.14mm/a respectively. Combined with field condition and study results, some conclu-sions have been reached:The Cretaceous tectonic uplift event was influenced by the subduction of the Yarlung Zangbo River. The second tectonic movement took place between 50Ma and 35Ma and its intensity was weaker than that of the first one. The Paleogene tectonic uplift event was related to Indo-Eurasian collision. Since 20Ma, the cooling and denudation rates have been 3.25～6.0℃/Ma and 0.03～0.2mm/a respectively, and this tectonic movement has been influenced by the Cenozoic whole uplifting and the stretching strike-slip environment in Tibet. 康铁生, 王世成. 地质热历史研究的裂变经济方法[M]. 北京: 科学出版社, 1991: 1-61. 向树元, 马新民, 泽仁扎西, 等. 嘉黎断裂带两侧晚新生代差异隆升的磷灰石裂变径迹记录[J]. 地球科学——中国地质大大学学报, 2007, 32(5): 615–621. 向树元, 张士贞, 胡敬仁, 等. 西藏米拉山断裂活动的磷灰石裂变径迹证据[J]. 地球科学——中国地质大学学报, 2012, 37(增刊2): 39–46. 丁林, 钟大赉, 潘欲生, 等. 东喜马拉雅构造结上新世以来快速抬升的裂变径迹证据[J]. 科学通报, 1995, 40(16): 1497–1500. DOI:10.3321/j.issn:0023-074X.1995.16.018. 江万, 莫宣学, 赵崇贺, 等. 矿物裂变径迹年龄与青藏高原隆升速度研究[J]. 地质力学学报, 1998, 4(1): 13–18. 袁万明, 王世成, 李胜荣, 等. 西藏冈底斯带构造活动的裂变径迹证据[J]. 科学通报, 2001, 46(20): 1739–1742. DOI:10.3321/j.issn:0023-074X.2001.20.017. 袁万明, 侯增谦, 李胜荣, 等. 雅鲁藏布江逆冲带活动的裂变径迹定年证据[J]. 科学通报, 2002, 47(2): 147–150. 王国灿, 向树元, John I G, 等. 东昆仑东段巴隆哈图一带中生代的岩石隆升剥露——锆石和磷灰石裂变径迹年代学证据[J]. 地球科学——中国地质大大学学报, 2003, 28(6): 645–652. 赵志丹, 莫宣学, 郭铁鹰, 等. 西藏南部岩体裂变径迹年龄与高原隆升[J]. 自然科学进展, 2003, 13: 877–880. DOI:10.3321/j.issn:1002-008X.2003.08.017. 柏道远, 贾宝华, 王先辉. 青藏高原隆升过程的磷灰石裂变经济分析方法[J]. 沉积与特提斯地质, 2004, 24(1): 35–40. 刘德民, 李德威, 杨巍然, 等. 喜马拉雅造山带晚新生代构造隆升的裂变径迹证据[J]. 地球科学——中国地质大学学报, 2005, 30(2): 147–152. 王岸, 王国灿, 谢德凡, 等. 东昆仑山小南川岩体裂变径迹年代与中新世晚期以来的构造地貌演化[J]. 地球科学——中国地质大大学学报, 2007, 32(1): 51–58. 曹凯, 王国灿, 刘超, 等. 西昆仑及邻区新生代差异隆升的热年代证据[J]. 地球科学——中国地质大学学报, 2009, 34(6): 895–906. 张忠奎, 陈祥高, 藏文秀. 西藏康马多得乡花岗岩的裂变径迹年龄和上升速度研究[J]. 岩石学报, 1986, 2(1): 45–49. Donelick R A, O'Sullivan P B, Ketcham R A. Apatite fissiontrack analysis[J]. Reviews in Mineralogy and Geochemistry, 2005, 58(1): 49–94. DOI:10.2138/rmg.2005.58.3. 任战利, 崔军平, 郭科, 等. 鄂尔多斯盆地渭北隆起抬升期次及过程的裂变径迹分析[J]. 中国科学:地球科学, 2015, 60(14): 1298–1309. 潘桂棠, 李兴振, 王立全, 等. 青藏高原及邻区大地构造单元初步划分[J]. 地质通报, 2002, 21(11): 701–707. DOI:10.3969/j.issn.1671-2552.2002.11.002. 潘桂棠, 王立全, 朱弟成. 青藏高原区域地质调查中几个重大科学问题的思考[J]. 地质通报, 2004, 23(1): 12–19. 赵文津, 赵逊, 史大年, 等. 喜马拉雅和青藏高原深剖面(IN-DEPTH)研究进展[J]. 地质通报, 2002, 21(11): 692–700. 吴珍汉, 叶培盛, 殷彩云. 藏北改则新生代早期逆冲推覆构造系统[J]. 地球学报, 2013, 34(1): 31–38. DOI:10.3975/cagsb.2013.01.04. Yin A, Harrison T M. Geologic evolution of the Himalayan-Ti-betan orogen[J]. Anna.Rev.Earth Planet.Sci.Lett, 2000, 28: 211–280. DOI:10.1146/annurev.earth.28.1.211. Kapp P, Murphy M A, Yin A, et al. Mesozoic and Cenozoic tec-tonic evolution of the Shiquanhe area of western Tibet[J]. Tecton-ics, 2003, 22(4): 1029–1332. Wu Z H, Ye P S, Patrick J B, et al. Early Cenozoic mega thrust-ing in the Qiangtang Block of the Northern Tibetan Plateau[J]. Acta Geologica Sinica, 2012, 86(4): 799–809. DOI:10.1111/j.1755-6724.2012.00707.x. Guitang Pan, Liquan Wang, Rongshe Li, et al. Tectonic evolution of the Qinghai-Tibet plateau[J]. Journal of Asian Earth Sciences, 2012, 53: 3–14. DOI:10.1016/j.jseaes.2011.12.018. 姜高磊, 韩芳, 宋博文, 等. 西藏改则盆地渐新统-中新统康托组沉积相特征[J]. 地质通报, 2013, 32(1): 165–174. 李才, 黄小鹏, 迟效国, 等. 藏北羌塘南部走构由茶错地区火山岩定年与康托组时代的厘定[J]. 地质通报, 2006, 25(1/2): 226–228. 吴珍汉, 吴忠海, 胡道功, 等. 青藏高原渐新世晚期隆升的地质证据[J]. 地质学报, 2007, 81(5): 577–587. Yin A, Harrison T M, Reyerson F J, et al. Tertiary structural evolu-tion of the Gangese thrust ststern in southern Tibet[J]. Journal of Geopgysical Research, 1994, 99: 18175–18201. DOI:10.1029/94JB00504. 吴珍汉, 江万, 周继荣, 等. 青藏高原腹地典型岩体热历史与构造-地貌演化过程的热年代学分析[J]. 地质学报, 2001, 75(4): 468–476. 吴珍汉, 吴学文, 赵珍, 等. 羌塘地块南部晚白垩世火山岩离子探针测年及其对红层时代的约束[J]. 地球学报, 2014, 35(5): 567–572. DOI:10.3975/cagsb.2014.05.06. 吴珍汉, 刘志伟, 赵珍, 等. 羌塘盆地隆鄂尼-昂达而错古油藏逆冲推覆构造隆升[J]. 地质学报, 2016, 90(4): 615–627. Amijo R, Tapponnier P, Mercier J L, et al. 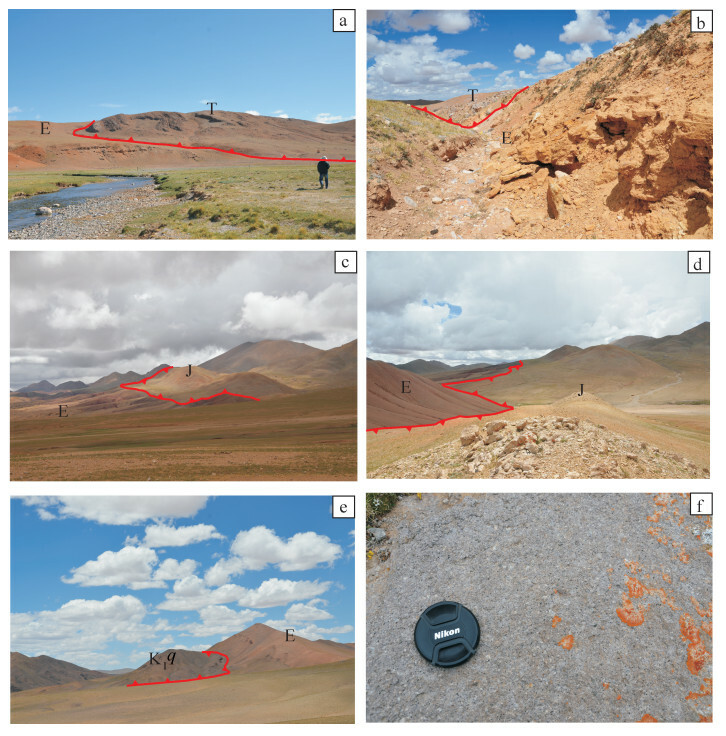 Quaternary extension in south Tibet:Field observations and tectonic implications[J]. Jour-nal of Geophysical Research, 1986, 91(B14): 13803–13872. DOI:10.1029/JB091iB14p13803. Harrison T M, Copeland P, Kidd W S F, et al. 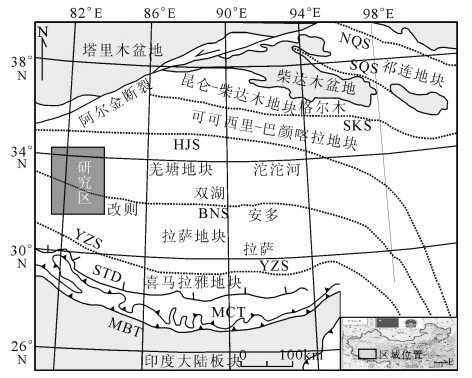 Activation of the Nyainqentanghla shear zone:Implications for uplift of the southern Tibetan Plateau[J]. Tectonic, 1995, 14(3): 658–676. DOI:10.1029/95TC00608. Blisniuk M P, Hacker R B, Glodny J, et al. Normal faulting in cen-tral Tibet since at least 13.5Ma ago[J]. Natrue, 2001, 412: 628–632. DOI:10.1038/35088045. Tapponnier P, Xu Z, Roger F, et al. Oblique stepwise rise and growth of the Tibbetan Plateau[J]. Science, 2001, 294: 1671–1677. DOI:10.1126/science.105978. 樊帅权, 史仁灯, 丁林, 等. 西藏改则蛇绿岩中斜长花岗岩地球化学特征、锆石U-Pb年龄及构造意义[J]. 岩石矿物学杂志, 2010, 29(5): 467–478. 王保弟, 许继峰, 曾庆高, 等. 西藏改则地区拉果错蛇绿岩地球化学特征及成因[J]. 岩石学报, 2007, 23(06): 1521–1530. DOI:10.3969/j.issn.1000-0569.2007.06.026. 张玉修, 张开均, 黎兵, 等. 西藏改则南拉果错蛇绿岩中斜长花岗岩SHRIMP U-Pb年代学及其成因研究[J]. 科学通报, 2007, 52(01): 100–106. DOI:10.3321/j.issn:0023-074X.2007.01.017. 姜高磊, 袁爱华, 张克信. 西藏改则盆地晚始新世康托组介形类动物群及地质意义[J]. 微体古生物学报, 2014, 31(4): 405–419. Gleadow A J W, Duddy I R, Green P F, et al. Confined fission track lengths in apatite:A diagnostic tool for thermal history analysis[J]. Contrib.Mineral.Petrol, 1986, 94: 405–415. DOI:10.1007/BF00376334. Green P F. On the thermo-tectonic evolution of northern England:evidence from fission track analysis[J]. Geology, 1986, 5: 493–506. Hurford A J, Green P F. A users' guide to fission-track dating cali-bration[J]. Earth Planet. Sci. Let, 1982, 59: 343–354. DOI:10.1016/0012-821X(82)90136-4. Green P F. A new look at statistics in fission track dating[J]. Nucle-ar Tracks, 1981(5): 77–86. 袁万明, 杨志强, 张招崇, 等. 安徽省黄山山体的隆升与剥露[J]. 中国科学:地球科学, 2011, 41(10): 1435–1443. 王立成, 魏玉帅. 西藏羌塘盆地白垩纪中期构造事件的磷灰石裂变径迹证据[J]. 岩石学报, 2013, 29(3): 1039–1047. Yuan W M, Dong J Q, Carter A, et al. Mesozoic-Tertiary exhuma-tion history of the Altai Mountains, northern Xinjiang, China:con-straints from apatite fission track data[J]. Tectonophysics, 2006, 412: 183–193. DOI:10.1016/j.tecto.2005.09.007. Yuan W M, Bao Z K, Dong Ji Q, et al. Zircon and apatite fission track analyses on mineralization ages and tectonic activities of Tu-wu-Yandong porphyry copper deposit in northern Xinjiang, Chi-na[J]. Science in China(Series D), 2007, 20(12): 1787–1795. 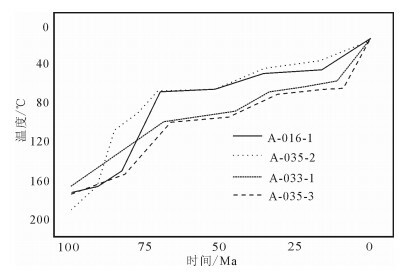 Ketcham R A, Donelick RA, Carlson W D. Variability of ap-atite fission-track annealing kineticsⅢ:Extrapolation to geological time scales[J]. American Mineralogist, 1999, 84: 1235. DOI:10.2138/am-1999-0903. 潘保田, 高红山, 李吉均. 关于夷平面的科学问题——兼论青藏高原夷平面[J]. 地理科学, 2002(5): 520–526. 杜德道, 曲晓明, 王根厚, 等. 西藏班公湖-怒江缝合带西段中特提斯洋盆的双向俯冲:来自岛弧型花岗岩锆石U-Pb年龄和元素地球化学的证据[J]. 岩石学报, 2011, 27(7): 1993–2002. 李金祥, 李光明, 秦克章, 等. 班公湖多不杂富金斑岩铜矿斑岩-火山岩的地球化学特征与时代:对成矿构造背景的制约[J]. 岩石学报, 2008, 24(3): 531–543. 孙立新, 万晓樵, 吴新国, 等. 雅鲁藏布结合带中段混杂岩带内玄武岩的地球化学特征[J]. 地质通报, 2005, 24(1): 65–71. 莫宣学. 青藏高原地质研究的回顾与展望[J]. 中国地质, 2010, 37(4): 841–853. 张克信, 王国灿, 徐亚东, 等. 青藏高原古近纪-新近纪地层格架与沉积演化及其对构造隆升的响应[J]. 地层学杂志, 2013, 37(4): 570–586. 吴珍汉, 叶培盛, 胡道功, 等. 拉萨地块北部逆冲推覆构造系统[J]. 地质论评, 2003, 49(1): 75–81. 吴珍汉, 赵立国, 叶培盛, 等. 青藏高原中段渐新世逆冲推覆构造[J]. 中国地质, 2011, 38(3): 522–536. Wu Z H, Ye P S, Barosh P J, et al. Early Cenozoic mega thrust-ing in the Qiangtang block of the Northern Tibetan Plateau[J]. Acta Geologica Sinica, 2012, 86(4): 799–809. DOI:10.1111/j.1755-6724.2012.00707.x. Kapp P, Decellcs P G, Gehrels G E, et al. Geological records of the Lhasa-Qiangtang and Indo-Asia collisions in the Nima area of cen-tral Tibet[J]. GSA Bulletin, 2007, 119(7/8): 917–932. Dewey J F, Shackleton R M, Chang C F, et al. 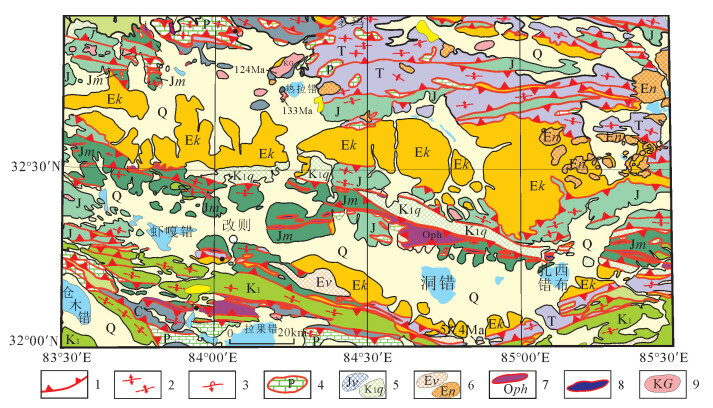 The tectonic evolu-tion of the Tibetan Plateau[J]. Phil. Trans. Roy. Soc, 1988, A327: 379–413.